Warp & Phil Augusta fabrics feature two distinctive weaves combined in one textile, providing a unique visual and tactile aesthetic for bedding and shower curtains. Augusta fabrics coordinate beautifully with Warp & Phil Pandora and Manhattan fabrics for a complete bedding package. Made from 100% Polyester FR Augusta fabrics, with intricate designs artfully woven into the fabric for a high quality look and the performance hotels require. 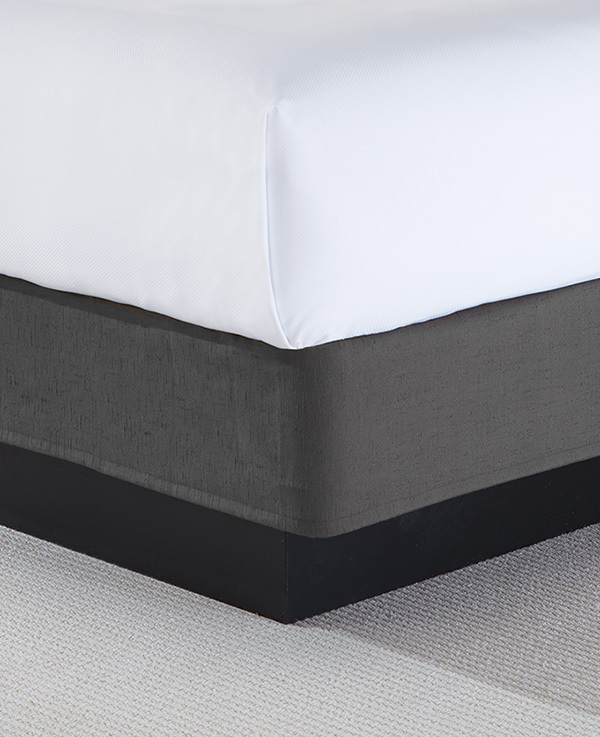 This Top Sheet is specially engineered and woven with no seams for a clean, finished appearance, and produced 3" wider to accommodate a “tucked-in” look. Available in 5 colorways: Smoke, Eggplant, Midnight, Sand Dune, and Ultra Marine. Made from 100% Polyester FR Manhattan Fabrics that give beautiful texture and shape to accent pillows. Also great for bed scarves. Available in 6 colorways: Bedazzled Blue, Boysenberry, Mineral, Sedona, Artichoke, and Navy. Made from 100% Polyester FR Pandora Fabrics, Warp & Phil offers choices for completing the bed, with the option of a traditional Bed Skirt or a more contemporary Bed Wrap. Bed Skirts fall approximately ½" off the floor, while Bed Wraps extend just beyond the box spring. Available in 5 colorways: Terra, Berry, Lava, Pebble, and Glacier. Augusta Fabrics are also great for shower curtains. Their 100% Polyester easy-care construction makes laundering a breeze and retains a crisp, beautiful appearance. Shown in Sand Dune. Available in 5 colorways: Eggplant, Midnight, Sand Dune, Smoke, and Ultra Marine.